Russia was not considered to be the favourite to win the gold medal, but new team manager Pavel Bure was very committed to creating the best possible team. After the roster was selected, injuries hit hard – Nikolai Khabibulin, Alexei Zhitnik, Dmitry Bykov, and Alexei Zhamnov had to be replaced by Maxim Sokolov, Vitali Vishnevsky, Sergei Zhukov, and Alexander Korolyuk. 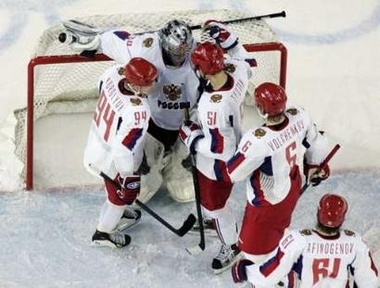 After losing to the Slovaks in the first match, coach Vladimir Krikunov benched goalie Ilya Bryzalov and went with Evgeni Nabokov, who made his long-awaited Team Russia debut with back-to-back shutouts. Unfortunately, Russia failed to win a medal in men’s hockey for just the second time in its Olympic history. In easily the most memorable hockey game of the Torino Olympics, Russia finally faced Canada for the first time since the NHL began to send its best players to the Olympics. Both teams played conservatively until the third period, when who else but Ovechkin finally broke the scoreless tie. Russia’s quarterfinal win over Canada was glorious, but it drained all the energy from the team, leading to very tired and sluggish performances in the last two matches. In the semifinal match against Finland, Russia was left with only eleven forwards due to Malkin’s suspension and injuries to Frolov and Korolyuk. 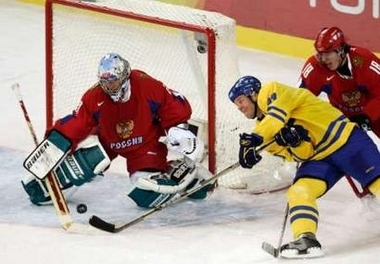 The team also failed to realize any scoring chance in the bronze medal match against the Czechs. On the bright side, this was a younger team with fewer controversies than usual. The team gathers around Maxim Sokolov after beating the U.S. But going back to his religious house is unlikely to be enough on its own to inspire Torres.